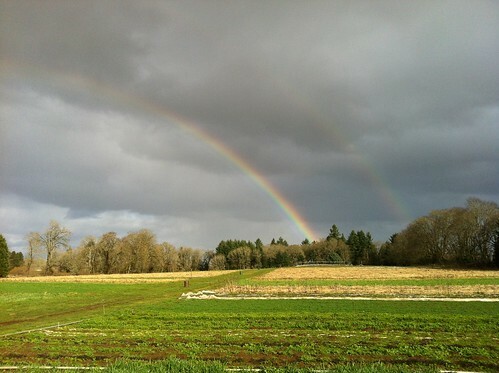 Spectacular double rainbow captured by Francesca on the afternoon of February 1. What a way to kick off a new month! With this splash of spectacular weather this week (see photo above) we thought it timely to share a bit about weather windows; what they are, and how we use them out at the farm in the winter. To a farm, a weather window is a limited period of time when weather conditions can be expected to be suitable for a particular project, such as cleaning up fall fields, turning in cover crop, or spreading fertility amendments. With a recorded 11.3 inches of rain on our property in the month of January we welcome this week’s weather window with open arms. You know predicting the weather here in the winter is never easy, but when we see forecasts of two or more days of sunny clear skies we shift our energies from planning and maintenance to field clean up and tillage. We will remove irrigation line, trellis stakes, and floating row cover still left in the fields from last season. Once this is done cover crop will be planted. Fields that got cover cropped in the fall will begin to be tilled for spring planting. Planting begins mid-March but tilling happens about a month before to allow the cover crop to break down in the soil. We will definitely be out working in and enjoying the sunny weather this week, and hope you too soak up some rays. Tell your friends, tell your neighbors, its not too late to share in the harvest for 2012! We still have Family, Half and Salad Shares available and signing-up is quick and easy! Just complete the Community Farm Agreement and submit on-line. An added bonus to signing up now: everyone who sends in their deposit in February will receive a $5 gift card from Food Front Cooperate Grocery.